As you know the GTA series is renowned for it's witty, lewd puns and references hidden within it's games. San Andreas certainly has its fair share of these, while you may know what many of these mean, you definately won't know all of them. 1UP.com have posted a lot of them with what they call childish explanations of them, makes for some interesting reading. There are some noticeable ones they haven't mentioned, possible because it's just so obvious but that is the structure of the Sphinx in Las Venturas, aptley named "The Camel's Toe" doe to the general positioning of the legs of the animal. For those of you who are too young to understand what one is, I will briefly describe it. Basically it's when a woman wears quite tight clothing around their um.. groin area and you can then see the um... lips... down there. This is just a reminder to everyone in Europe that the 2CD and DVD set for San Andreas is out today. Those of you in North America will be able to pick this set up tomorrow. If you would like to buy from Amazon the links are in the announcement box above. Rockstar have just told us that IGN will be releasing the official trailer for "The Introduction" as well as some stills from it tonight so be sure to keep an eye out for it. For those of you who don't know yet, The Introduction is a cinematic prologue to Grand Theft Auto: San Andreas. It will be released across America on November 23rd and throughout Europe on November 22nd. This DVD is a must have for any big GTA fan, and if you would like to preorder your copy you can do so from Amazon.com or Amazon.co.uk who are selling it at cheaper than most actual shops. Leading the way with five nominations apiece are Microsoft's Halo 2, Vivendi Universal's Half-Life 2, and Rockstar's Grand Theft Auto: San Andreas. Those games cross paths in the Game of the Year category. Other GOTY nominees include Konami's Metal Gear Solid 3: Snake Eater and Electronic Arts' Burnout 3: Takedown. Following the incredible success of GTA San Andreas, Rockstar North, subsidary of TakeTwo have granted all employees a one month paid leave. The gesture follows the huge success of the latest in the Grand Theft Auto series. This has been supported by local groups such as CBI Scotland who believe firms should give staff generous benefits. Rockstar have updated the official San Andreas site with a load more wallpapers and a few new postcards. They are all based on artwork we have seen before but in many different resolutions for use on your own computer. I would just like to point out that i have taken the time to make sure ALL of our downloads are working, I made a little debugging script that checks every single file in pafiledb to tell me whether a file exists or not and whether the screenshot exists or not. I used this and it now says everything exists so there shouldn't be any broken links, however if you do find any then please tell us. Thank You. Sorry once again for the downtime last week, I really do hope this doesn't happen again. 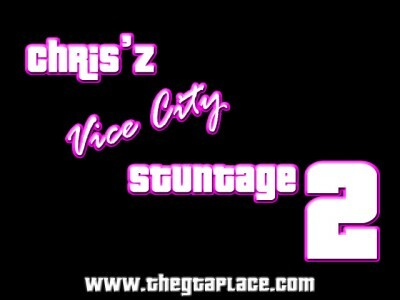 Anyway on a positive note, I did get my second Vice City stunt video uploaded. It's been sitting on my computer for 6 months now (yes, all that time). It's over 5 minutes long and contains all new stunts not seen in my first stunt video. Music is by Metallica, its just over 49Mb so you'll need a fast connection if you wanna watch it today. Click the pic above to download it, Enjoy! Gamespot have made their own guide to San Andreas, including lots of screenshots of where you need to go and what you need to do. It's good if you are stuck somewhere in the game, our forums are also another good place to go. You will need a free Gamespot basic account to view the guide, and Gamespot Premium members can download a .pdf copy to keep.